The Association of Pan-European Coach Terminals (APC) celebrated its 15th anniversary by organizing a workshop entitled “Innovations in passenger transport with bus and coach and terminal development in the future” in Riga, September 3-5, 2018. Representatives from public transport authorities, operators, coach terminals, APC members and Transport and Telecommunication Institute (TTI) had the opportunity to share experiences and provide insights into the future development of passenger transport services. TTI Vice-Rector for Science and Development Affairs Prof. Irina Yatskiv gave a presentation about one of the most emerging topics in transportation research entitled “Possible effects of connected and automated driving on the economy, employment and skills”. Analytically, Prof. Yatskiv presented an overview of the challenges and main research questions in this area, focusing on risks and safety. This presentation is based on Prof. Yatskiv participation at the 6th EU-US Transportation Research Symposium JUNE 26-27, 2018 (Brussels) “Socio-economic Impacts of Automated and Connected Vehicles” that organized the Transportation Research Board (TRB), in collaboration with the European Commission (EC) and US Department of Transportation (USDOT). During this two-day symposium 25 researchers from EU countries and 25 researchers from US discussed the draft of European White Paper “Synthesis of the Socio-Economic Effects of Connected and Automated Vehicles and Shared Mobility”. TTI researcher Kristine Malnaca presented the results of the study “Economic viability of converted diesel city bus into electric bus” which was performed within a research project implemented by the company “Ferrus” in Riga. Other topics that were discussed were the assessment of new bus technologies, passenger needs, management and improvement of public transport services, safety and security in passenger terminals and future challenges for public transport service development. 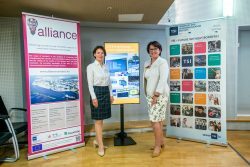 ALLIANCE project announces the Scientific Excellence Award – Update!